Atkinson Design Associates were formed in 1982 and invention has been a cornerstone of our approach to design challenges from the beginning. Our clients are notable companies in a variety of industry sectors, such as Knoll International in furniture, Concord in lighting, Boots in cosmetics and Peugeot in automotive. Our services reflect the range of our client needs, covering product development of industrial systems, furniture, lighting and corporate or retail environments, as well as the big challenge of energy generation through green tech innovation. The invention inherent in our work has been recognised by numerous patents and international design awards and exports to clients in fifty countries worldwide. The essence of our relationships with clients is to make the journey from briefing to design outcome one of transparency and clarity. 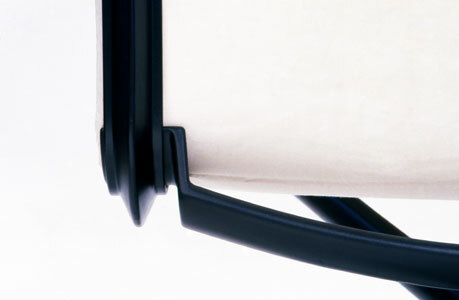 We focus on designs that are conceived to last, are efficient to manufacture, and use resources with care and integrity. We think a lot about the choices the design consultant has to make and work in open collaboration with clients to avoid transient and short-term solutions. Our inventive process includes the development of a strong underpinning logic for design products that are systematic, efficient and long lasting. While the world has changed considerably over the past thirty years, our approach to the economics of design is more essential than ever. Atkinson Design Associates closed on October 2015. 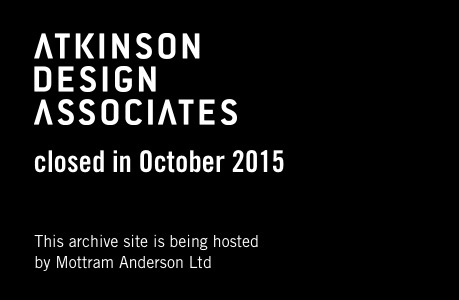 Atkinson Design Associates closed in October 2015. This archive site is being hosted by Mottram Anderson Ltd. The headquarters interior for Big Communications has been an unusual adventure. Big have a big reputation as Advertising Agency, Creative Agency and Brand Communicators, with over one hundred staff expert in sound, word and image. Early in the design process we agreed, in order to ensure the interior adequately reflected the creative identity of Big, that key creatives from the Agency team should be involved in the design process. The ebb and flow of the creative discourse was well managed, courteous, humorous and only occasionally mad. We are very pleased with the results. The scheme reflects Atkinsons design intent while also reflecting the unique creativity Big offer to their clients. The delivery of the scheme itself required six areas of the building being ripped out and renewed in sequence. So the client’s patience and support was vital throughout the project management period, the Agency remained fully active whilst selected contractors delivered each space on a pre agreed systematic basis. 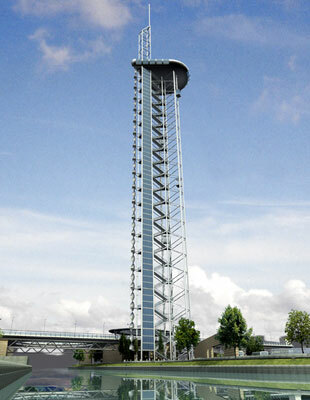 The scheme was completed in September 2011. Atkinson Design Associates were commissioned by THS Architects to provide FF&E consultancy services for two Roman Catholic sixth form colleges. ADA’s brief was to ensure the furniture specification ‘prevented any sense of disappointment when entering the building’, was compatible with the architectural interior and reflected the investment and commitment the clients were making to their students. The images shown are from St Benedict’s Catholic sixth form college in Alcester. ADA were involved from the beginning of each project. In addition to detailed costing we ensured that the products were from reliable manufacturers with environmental policies regarding production, including sustainably sourced materials with recyclable properties and suitable warranties. Above all the products had to be robust enough to withstand a lively, youthful environment. The final product selection reflects a balance between pragmatism, aesthetics and cost. ADA were also tasked with the furniture purchasing strategy for each project. We took responsibility for project managing order entry, the co-ordination of phased deliveries and installation through to the point of final handover. Both schools are delighted with their new buildings and believe that they successfully reflect their institutions optimism and commitment to the future of their students and support every aspect of student recruitment and retention. 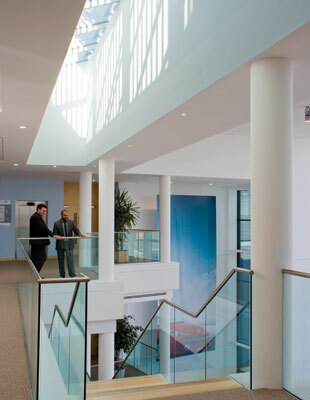 The Torch range of directional fixtures was designed for Concord Lighting. The product collection was launched at the Euroluce Lighting Fair in Milan and commercial sales of 8,000 products were complete within 48 hours. Return on investment occurred in the same two day period. The product went on to win Design Awards in Germany and within two years total sales exceeded any other lighting product made in Concord’s history. By year 3 the Director of Manufacturing advised us that Torch was the most profitable product per cubic metre of manufacturing space in the companies history. Sales and marketing success allied to good design is always rewarding but equal pleasure came from the Concord factory in Newhaven. The best production staff of 300 migrated to the Torch assembly line to put the product together. The claim was that it was beautiful to touch and incredibly simple to put together leading to all sorts of shop floor production bonuses. Janet Turner, Director of Marketing, Concord SLI. The Tile programme of lighting was developed for Concord Lighting. 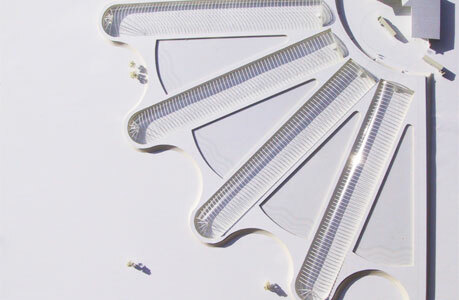 A series of wafer thin flat luminaries were developed to distribute the passive low energy ambient light of compact fluorescent lamps in combination with a programme of directional display luminaires employing halogen lamps. The small scale and larger scale luminaires made it viable to walk into residential sized interiors and light the whole space without needing to fix into or onto the architecture. The Text table programme is a collection of tables and table desks made from a series of alloy profiles and connectors. First sales of the collection in the UK were to the London headquarters of Reuters followed by project sales to Unilever and the European Bank. The new retail system was developed during 2010. The design brief for the system emerges from the first principles of simplicity and sustainability. The “less is more” agenda and the recent economic crash invites even the most powerful retailers to demand higher quality at lower unit cost. The system is established as a flat pack construction using a series of industrial materials that are only 6mm thick. As a result the cost of shipping and distribution with associated emissions are reduced to a minimum, but working on a fastener to tie very thin sheet materials together proved intriguing. A high proportion of fixings and fasteners are attached within the thickness of more conventional panel materials, but our pursuit of 6mm denied us this opportunity. The fastener developed is rotated through 90 degrees to address this difference and hold the various junctions in compression. The universal fastener sits at each junction and can carry various arrays of doors, drawers, fronts, backs, branding devices, pricing strips and lighting elements. 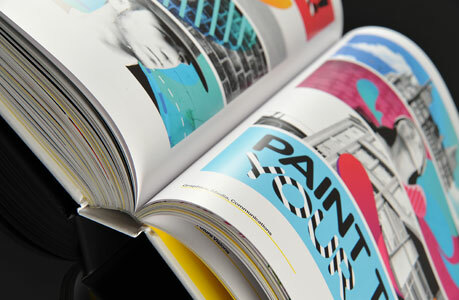 The principle product is extremely flexible but visually quiet allowing brand to be the dominant essay. We were invited by the architect Julian Marsh to contribute design and lighting design services to a master planning and urban regeneration project in the centre of Nottingham. The Meadows district of south central Nottingham has been the centre of policy debate for the past twenty years. Nottingham City Council supported the principle intentions of the project, including the redefinition of public spaces and green open areas, consequential improvements to leisure and sports facilities, the definition of the river embankment, the bridge, Memorial Gardens and the large inner city housing area to the north of the scheme. The meadows forms part of the river Trent floodplain and in consequence any urban design proposals have to accommodate this function. Julian’s scheme development included comprehensive public consultations and the community were participating in the project throughout its inception and development. 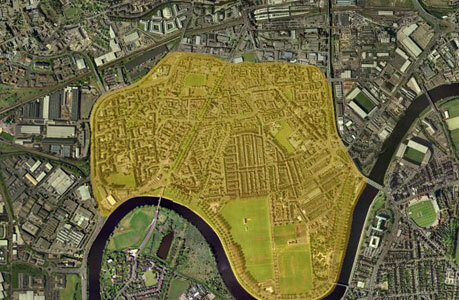 The architect’s ambition was to develop a zero carbon inner city regeneration project. The urban interventions were all “light touch” and redefined the public realm with high quality inserts that confirmed community thoroughfares and a desire for improved facilities. Parts of the project are ongoing and the local community remain committed to reducing carbon energy consumption and sustainable energy residential developments. The Outdoor Group is a series of seating developments undertaken for Knoll International. 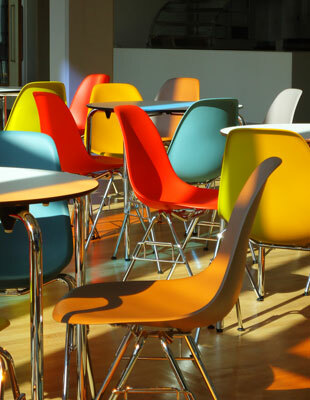 The prospectus developed by the design team embraced the rate of development of the hotel and leisure industries, and this combined very well with Knoll’s determination to lead on product design in this sector beyond its core business of corporate HQ furniture. The seating developed is analogous to two interlocking “tuning fork” frames with a tensile membrane captured by the two frame structures. 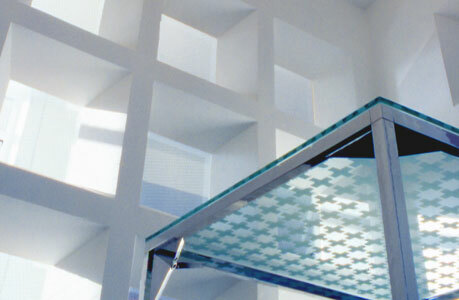 The seating is transparent and cool for hot climates. 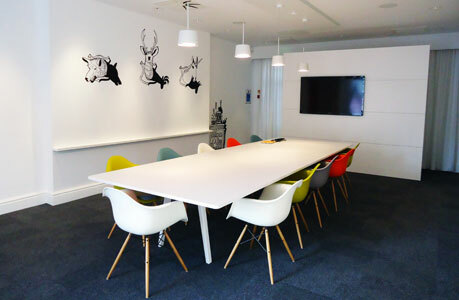 The interiors project for Unite included a student breakout space attached to the main residential development in the centre of Nottingham. This part of the project required a very simple restoration of the 19th Century interior with an injection of colour, contemporary lighting beams and other resilient elements. Our contribution to the interior was made in detailed consultations with Stephen George and Partners the project architects. 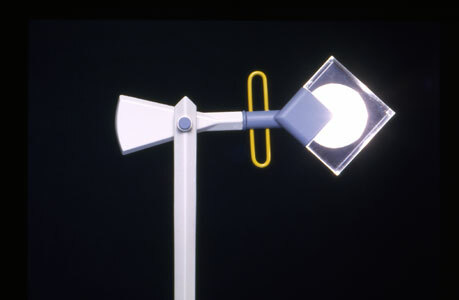 The Outdoor Lighting Programme was one of several design studies for Concord Lighting. Over a 24 month period a series of developments were undertaken to address a rapidly growing market opportunity in public space lighting. The basis of a much larger industrial system running from 20watt to 500watt outputs is illustrated by the simplest cast forms from the smaller products of this programme. Our efforts to understand the benefits and economic justifications for the Anaerobic project led us into detailed planning meetings with environmental scientists and regional food industries. It quickly became apparent that the principle bi-products of a 25,000 tonne digester plant are high volumes of high temperature air emerging from the turbine generators at approximately 650°C and high volumes of digestates which are a grade A liquid fertiliser. 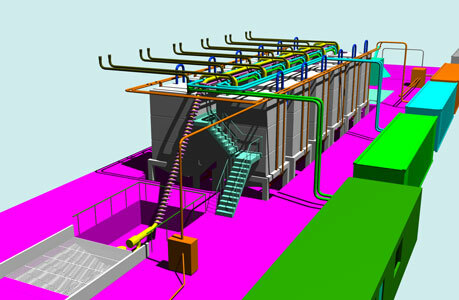 The normal dilemma of combined heat and power CHP plants is what to do with the surplus heat energy. When air at 650°C is combined with the 22,000 tonnes of grade A liquid fertiliser then the hothouse to grow organic food and other produce becomes quite obvious. In the interests of environmental sustainability we believe the UK should grow more produce local to consumption, for example 28% of total UK road haulage is attributable to shipping refrigerated food around the country. If we wish to free up the UK motorways we should grow more of our food near to market. The hothouse proposal intends to demonstrate balance and common sense in the interest of UK employment, UK value added and UK balance of payments. For example the UK consumes £65 million of strawberries per annum, £45 million are imported and the UK cut flower economy is worth £2.2 billion but £1.9 billion is imported. This issue is the soft edge of “green tech” and in part is why we advocate that low tech and high tech are equally important in addressing the climate change challenge. We were commissioned by the UK Arts Council to work with the project architect, Julian Marsh and the UK sculptor Anish Kapoor on the redevelopment of the public space and interiors to the Grade II listed Nottingham Playhouse. The design brief from the project architect was very clear, the arrays of seating and tables had to bring visual discipline and planning clarity to a brand new public space. The briefing in Anish’s London studio was more surprising. Anish was clear that the dominant environmental element was the “sky mirror” and that circular or elliptical furniture arrays were non-starters. Anish was keen to see the urban equipment cleared away as fast as possible and that the new table design should be transient in spirit. The resulting array of 10 bench tables can be cleared from the square in ten minutes. 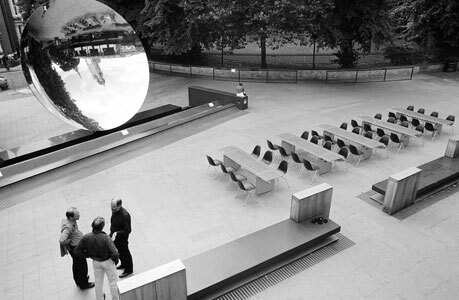 The tables contribute to the geometry and visual discipline of the public space in accordance with the architects brief, providing seating for 100 theatre goers beneath the sky mirror installation by Kapoor. Our development of the Real Time Display System followed the London Underground Clock Programme and comprehensive work on the ticketing barrier lines. In detailed customer consultations the need for improved real time information was a clear customer priority. The ten year planned maintenance strategy, implemented during our work on the clock, had reduced installation costs by 90% and health and safety risks of installation and maintenance by a similar percentage. The new clock was so small and light that a service engineers assessment of technical fault lasting more than 2 or 3 minutes led to an instant replacement in the field. A similar diagnostic and planned maintenance strategy was employed for the new Real Time Display System. The key difference in developing the Real Time Displays was simply the architectural scale of the new equipment. With horizontal booms at high level, the diagnostic procedure became laptop based, followed by the removal and replacement of the motherboard. The table and desk programme was commissioned by Knoll Europe. 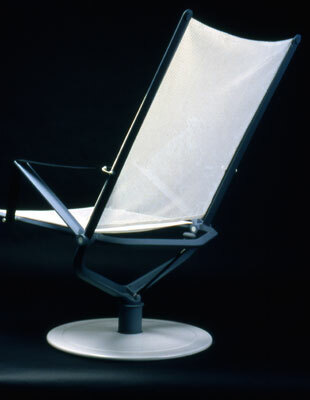 The products and reputation of Knoll International helped define the American Corporate Office during the second half of the 20th Century. The origins of the American “workstation” can be traced to the development of Action Office, and once this inventive step was made furniture corporations across the USA raced to compete with new modular workstation programmes. 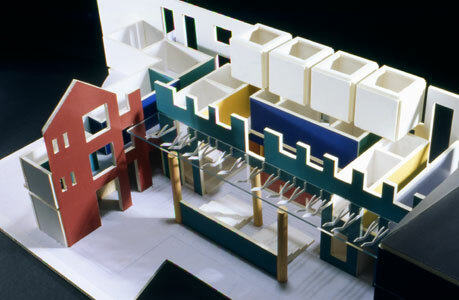 The American design response was to build furniture systems that allowed the workstation panel or wall components to become the dominant building block of American corporate interiors. 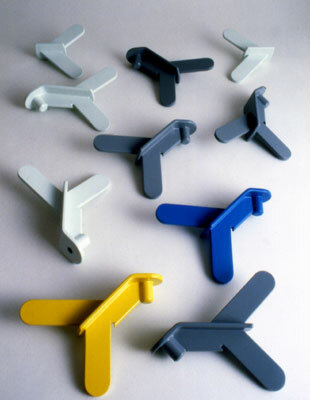 These panel and wall components served to divide Architectural interiors, describe boundaries to activities and define the edges of “my workplace”. We were approached by Knoll Europe to challenge the historic heaviness of the American workstation and to develop a table – desk programme which was more suited to the tradition of European Corporate architecture, a programme devoted to transparency, the minimisation of mass and the emergent requirement for increased mobility. The design study embraces a lightweight frame system bonded together via corner connectors that integrate small capsules of low melt adhesive. Our second sustainable technology project initiated in 2002 responded to the growing food waste mountain in the UK generated by the food processing and food retail industries. Our intuition at project inception was simply that the volume of UK organic waste was significant. In stark contrast to this intuition we took time to read the 18 acts of legislation bearing down on the related environmental pollution. The UK legislation includes the urgent reduction of organic materials going to landfill with rapidly increasing landfill taxes. Our design brief was to take the historic process of anaerobic digestion and to accelerate the process to meet or exceed the emerging legislation. Whilst the historic pattern of consumption, waste management and landfill is fiercely pragmatic, the contradiction is that organic waste can generate significant levels of renewable electricity. Our project seeks to maximise renewable electricity production in a small scale pilot plant of 25,000 tonne capacity. The inventive step is in the system design but the economic and environmental benefits are significant. A 25,000 tonne pilot plant will generate 4,660,320kwh of renewable electricity per annum, and a City the size of Leicester with a population of 300,000 can sustain four such micro plants at its periphery. The Horizon programme of exhibition and event lighting structures was commissioned by Concord Lighting. Projector lamps that could throw tightly resolved corporate images 15 metres were becoming an industry expectation. Emerging die cast luminaires that could project high resolution images this distance weighed several kilograms with metal halide lamps, running gear, glass lenses and image focus equipment on board. Horizon emerged from three concurrent market requirements. 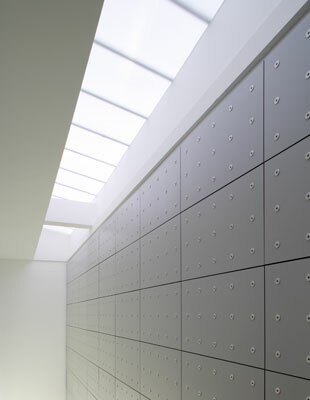 Firstly; the need to span several metres of exhibition or gallery space with structural integrity, secondly; to integrate a massive portfolio of Concord’s existing display lighting products and finally; that all of this should leave maximum flexibility of the exhibition gallery or retail floor beneath. In an effort to maximise this flexible display area, a series of free standing counterweighted lighting rigs were developed. The largest array of lighting rig covered an area of 2,000 square feet with only four points of contact at ground level. Whilst working with Michael Frye of Concord Lighting, one of our most dynamic industrial clients, we were asked to visit one of the group companies and spend some time with Stan Weitzel, Head of Engineering. Stan was close to retirement and falls into the “fundamentalist” camp of lighting engineers. Part of Stan’s career included his great pride in developing an early linear luminaire that became standard issue in all UK submarines. Stan’s background was robust, pragmatic and functional and unlike most engineers didn’t give a damn about the way things looked while ever the worked efficiently and made sense. Homage to Stan is precisely that, a luminaire with Churchilean overtones in homage to a great engineer. We were hired as interior design consultants for the new £25 million Peugeot Headquarters building in Coventry UK. The project architects were Stephen George and Partners. The brief required a full range of interior design services in parallel with detailed consultancy evaluations on all procurement procedures and supplier appointments. The headquarters building is a series of three storey pavilions arrayed around a central garden courtyard and circulation core. The schedule of accommodation for 500 staff includes a high proportion of open plan floor plates with private offices kept to a working minimum. Staff restaurants and kitchens and a product launch centre – conference facility for 200 guests occupy a large proportion of the ground floor beyond a 3 storey entrance lobby. 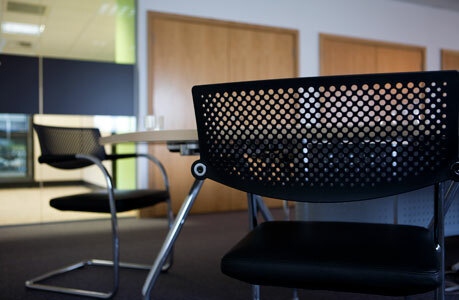 The client had ring fenced a procurement budget for the HQ furniture. We were asked to put an evaluations structure in place to maximise the quality of this portfolio of products. The procurement included the review of 14 European furniture suppliers in detail. This long list was reduced after detailed scrutiny to three leading companies. To assist the final procurement decisions each company supplied workstation environments for internal and external evaluations, these results further informed the client’s final decision. 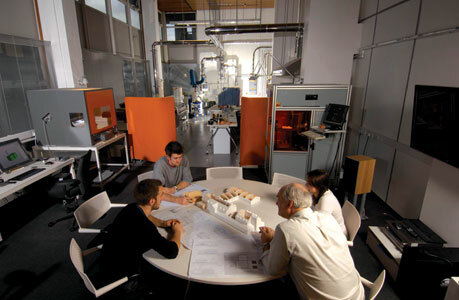 The EXO modular architectural system was commissioned by Owen Brown and a small consortium of international companies bidding for contracts at the Barcelona Olympics. The structural system had been in development at Atkinson Design for a 12 month period when the Barcelona Olympics opportunity emerged. 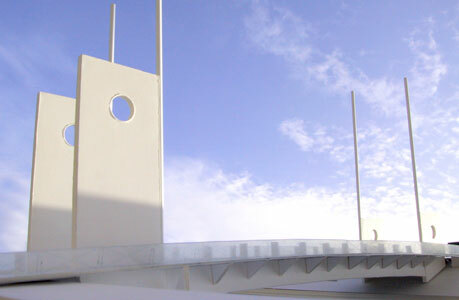 After a series of full size pre-industrial prototype builds had been completed the overall scale of the system had grown to span 7.5 metres between column centres. The hybrid polymer and alloy lattice beams were demonstrating incredible strength to weight and strength to cost ratios. In response to the need to accelerate industrial development we invited Anthony Hunt to become the consulting engineer to shift from structural theory to first commercial structures. Working with Anthony Hunt proved to be incredibly rewarding and the first small commercial installations were built for several UK Garden Festivals and for BBC television studios. In addition to the lightweight industrial frame structures and tensile roof elements, a clip in, clip out glazed wall and panelling system was developed to expand the flexibility of the system. A UK industrial client purchased an emerging glass extrusion company and asked Atkinson Design to do a fibre applications study. The study was much shorter and faster than a carbon fibre study previously undertaken for a UK aerospace client, but embraced an overview of future opportunities. 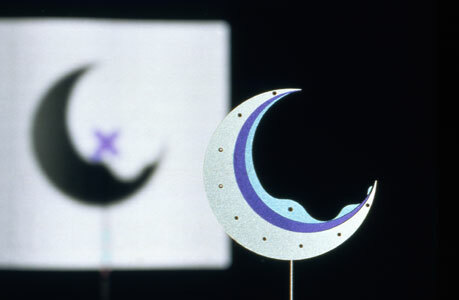 The fibre optic clock was one of the applications sitting in the consumer products category of that study and allows the technical – optical tale of white light to be animated through the product. 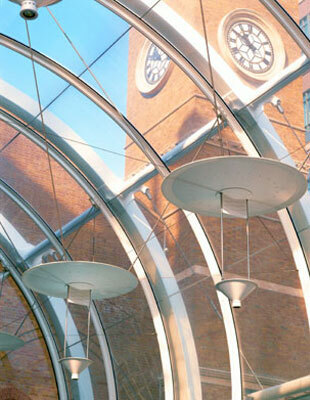 The lighting scheme for Liverpool Street Station was commissioned by British Rail Architecture and Design Group. After informal interviews in London we were asked to submit a lighting scheme strategy document that would detail an approach to both the Liverpool Street Station public areas embracing pedestrian routes to the bus deck and the adjacent Bishopsgate Underground Station entrance. In each instance the client architect, Alistair Landsley required shadow free, glare free light distribution to each scheme with a guarantee of 300 lux of even illumination to each pedestrian surface. Floodlighting from adjacent architectural façades was discounted on grounds of complexity, glare, shadowing and user discomfort. 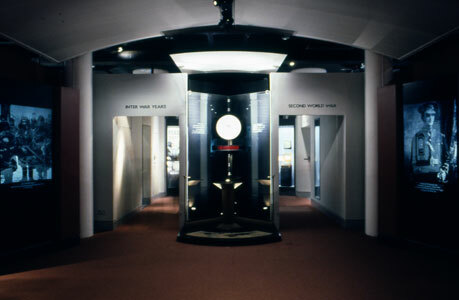 The solution to these design criteria was to use reflected light from large scale enamelled circular reflectors which would provide the required 300 lux of glare and shadow free illumination. 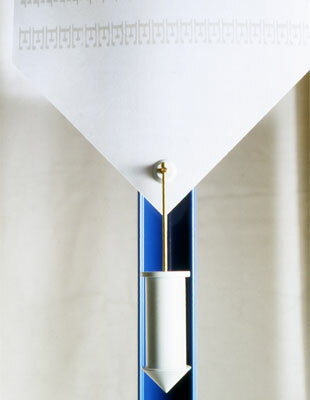 The design team built working samples of each of the key luminaires including the 10 metre tall arrays which were signed off by the architectural team and British Rail engineers. Once these optical arrays had been built and tested the design team managed the process through to site installation and handover. Shortly after our Liverpool Street and Bishopsgate Lighting schemes were completed we fell into small dispute with our landlords over the quality of light in our R and D workspace. The industrial ceiling was painted matt black and for those of us working 18 hours a day the lack of brightness was becoming an issue, particularly when very fine detail was being developed on models. The landlord wouldn’t fund the contractor costs for several coats of white paint to a few thousand square feet and we couldn’t sustain this impossible disruption and downtime. The precursor model for Hazel Duct emerged in two hours. 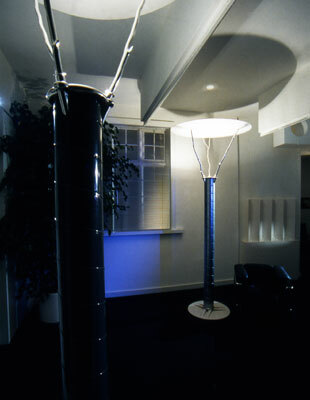 Developed by Jon Laws (senior designer at Atkinson Design) the initial mock up demonstrated a larger than human scale column luminaire and reflector. The luminaire provided an autonomous island of high quality reflected light that could trace the perpetual movement and reconfiguration of the studio. The proposal was so incredibly simple, six staff, six luminaires. 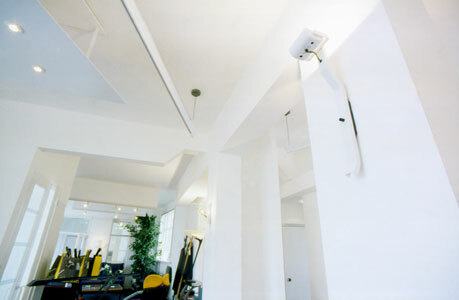 Concord Lighting were quick to see the benefits and flexibility. Once we showed Hazel Duct at the Hanover Light Show Siemens became the first customer, RIBA the second and the United Nations HQ in Geneva the third. 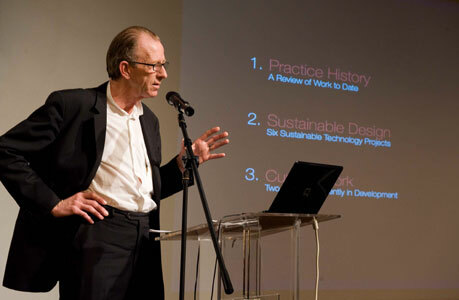 Atkinson Design Associates were invited to be keynote speakers at the Taiwan International Design Forum in December 2010. We were asked to make a presentation of our consultancy history and our efforts over the past decade on sustainable design embracing half a dozen sustainable technology projects. Our acceptance of the invitation was straight forward once we became aware of the conference title, “Green Products and Sustainable Cities”. The beauty of the pretext “Sustainable Cities” is that 90% of our sustainable projects relate directly to reducing carbon energy within our Cities, or generating renewable electricity adjacent to these urban centres of consumption. Dr Rungtai Lin the conference moderator held the discussion together very eloquently over a two day period. The presentation of Simon Chua of Benoys Hong Kong gave dramatic insight into the scale and speed of retail development in this region and an essay of architectural priorities in moving towards sustainable futures. During the conference we managed to visit three rapidly growing lighting technology companies. Separately we were the guest of the Taipei Design Centre and the investments being made in design by the Taiwan Government are significant. As a result of our published work in lighting design we were invited to London for an informal interview. The request was for Atkinsons to consider the brief, and describe our approach. When we asked for a written brief the architect could only articulate the abstract wishes of the client. 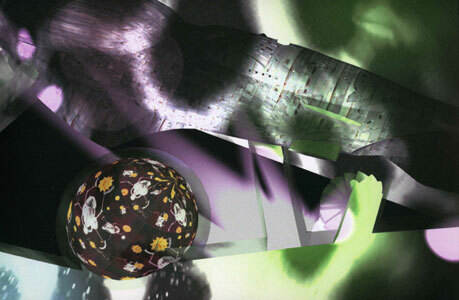 The installation demonstrates a “collage” of multi media devices that communicate the principles outlined in the abstract brief. The collage includes a large white circular clock that quietly challenges traditional expectations of a timepiece. A single black dial rotates through 360° in exactly six seconds and an adjacent digital display racks up another 3 lives lost in conflict. Concurrently the black dial triggers a bright burst of white light into a symbolic parachute overhead. The Duke of Edinburgh Award was commissioned by the Design Council as an award to the industrialist Robin Herd. The shortlist for the award was down to two. On one side the engineering team from Rolls Royce with the RB211 engine and on the other Robin. When we asked why had the Duke decided to give the award to Robin we received the following answer: “52 cars were entered for the 48 hour endurance race and only 15 finished…all 15 were built by Robin Herds company in Oxfordshire, no other competitor completed.” Armed with this persuasive description we spent a couple of hours in informal discussions with Robin at his March Racing HQ. Robin proved to be a charming and self effacing industrialist…he simply wanted a sun dial for his Oxfordshire home. The only design clues given included Robin’s Oxford Blues in cricket, his movement into property investment in Manhattan and that his Oxfordshire home had a south facing terrace in Cotswold stone. The sundial tries to capture some of Robin’s energy and achievement. 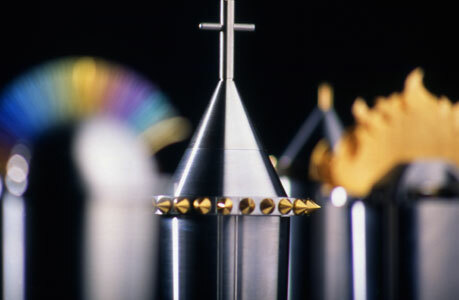 The cast bronze pedestal will patinate with age, whilst the calibrated titanium gnomon will appear brighter with time. The composer Pip Gresley developed a radical electronic operatic score exploring corporate and nationalistic conflict. 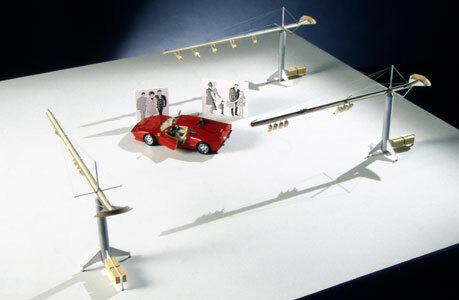 The televisual environment employed by the Producer provided many of the dramatic contextual images required for the piece, although continuity demanded visual linkage and the story-line required additional metaphors and icons. 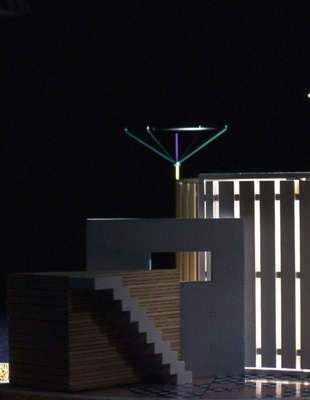 We were commissioned by Channel 4 Television to understand the objectives of the opera and to conceive and build a series of architectural, graphic and combat components to assist the visual continuity of the unfolding operatic drama. The chandelier is an exuberant design study for our own design studio first floor lobby. The lobby is a cubic space penetrated by a series of small fire rated windows that allow daylight to enter in a controlled manner but more significantly allow the trace of summer and autumn sunsets. The height of the lobby ceiling would not accommodate a conventional chandelier so the stepped geometry arises from both the stairs beneath and the otherwise compressed height between floor and ceiling. Having drawn up the overall assembly and built a couple of soft models we commissioned our development engineer Janu Pap and the jeweller Nick Aikman to make various key elements. The projector lamps in the foreground cast dramatic shadows of the Sun, the Moon and Saturn onto the titanium screens. The screen elements are analogous to sight screens familiar at County cricket grounds. 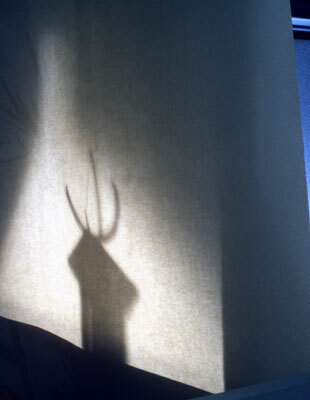 Instead of clarifying sight, they provide backdrops to hold silhouettes. The Changing the Change International Design Conference took place in Turin in July 2008. 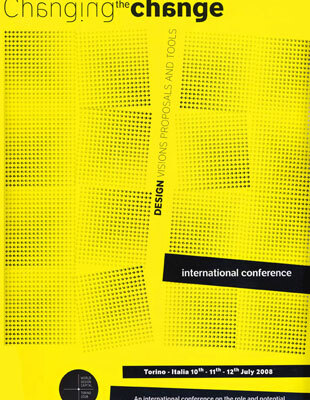 The subtitle “An International Conference on the Role and Potential of Design Research in the Transition towards Sustainability” gives a more accurate insight into the sustainable pretext for the conference. Our co-author, Dr Judith Mottram presented our paper “Design Stories for a Sustainable Society” which presented case studies of responsibility in design practice exploring three design projects tackling the energy challenges facing contemporary society. 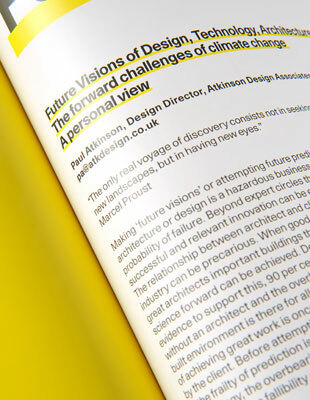 Whilst the underpinning question “how do designers respond to climate change” makes sense of a majority of papers presented to the conference, the issue is considerably wider. Remarkable keynote presentations were made by speakers from China, Japan, Australia, India, Africa, South America, North American and Europe. Put together the accumulative message became clear. “That designers and design researchers can make a fundamental contribution to the sustainable agenda, but that societal change and the role of communities is at least as significant in pursuing an agenda for change. And that the assumption…big science and big engineering will bail us all out is a dangerously fallible prospect. Turin was a relatively small conference with maybe two hundred and fifty delegates but the quality of the keynote presentations and the questions raised make it one of the most important conferences we have ever attended. Access to Art, a fast growing private sector educational consultancy were searching for a new HQ and studio facilities in the City Centre. The facility required dance, drama and music rehearsal studios, combined with private tuition rooms, conventional classrooms, administration offices, sound insulated recording studios and a crèche. The remodelling of No.1¬¬¬ Bond Street required an interiors scheme produced and costed at high speed. The feasibility study demonstrated that the clients schedule of accommodation could be successfully woven into the 1,100 square metre site, bringing another city centre building back into contemporary use. The cost of the four specialist recording studios including their insulation from road traffic vibration proved prohibitive within the constraints of the initial budget. However, the cost model and design strategy gave the client sufficient confidence to redevelop a comprehensive business plan and to bid for UK Arts Lottery funding. A second City Centre site was found adjacent to the river frontage in the north of the city and a second feasibility study initiated. The marketplace in the centre of Leicester is the largest covered marketplace in Europe. As part of the City Regeneration project, we were asked by the Head of Regeneration and Culture at Leicester City Council to undertake a design feasibility study to review the whole of the marketplace square. The briefing criteria were extensive and interrelated in a broad sweep of regeneration ambitions. The key client ambitions included, the demolition of the large red brick indoor market building to the west of the historic Cornmarket and replacement of this building due to dereliction and food hygiene legislation. The client brief also required a significant increase of basement level car parking, chilled storage facilities and access, egress in a fundamental upgrade of market traders facilities. Other briefing criteria included: The increase of public access and disability access. Development of a high quality stack of residential space above to approximately six storeys. Integration of a new public transport facility at the edge of the market square. The replacement of the monolithic roofscape to the full main market area. 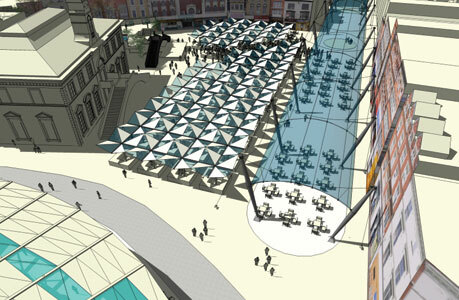 New flexible structures to allow the complete clearance of the market square. The establishment of clear containment of waste management trucks and improved food hygiene and waste management procedures. 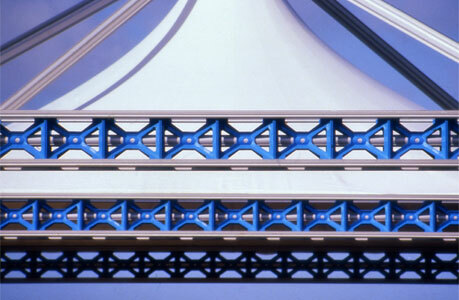 The Carbon Fibre Group of products were developed as part of a “blue sky” design study for a large UK industrial engineering group. The division of GEC were building development parts for the new European Fighter aircraft alongside other military components. As part of their management teams determination to diversify from an overdependence on military equipment, major orders had been secured in high tech construction industry sales. We were appointed after several interviews to take this diversification / evaluation one step further. The series of development projects included marine equipment, where the strength to weight ratios of carbon fibre elements really compete, and on into consumer products and contract goods. The work illustrated shows the development of an office chair structure where 90% of all mechanism has been stripped away. The evolving structural sections of the carbon fibre frame deliver all of the necessary resilience and compliance of good ergonomics. Whilst the materials are exotic the design principles embrace a “less is more” approach. Axiom is a programme of corporate office furniture designed for one of the leading Scandinavian furniture industries with manufacturing facilities in Norway. The client had built unprecedented market share with a network of national dealerships. However the Oslo economy was becoming so prosperous that leading international manufacturers from Europe and the USA were targeting Norwegian Corporate and Government customers and our clients domestic market share was reducing year on year. The precedent for Axiom was established at Board level and Marketing targeted the UK, Holland and Denmark as key export territories. Approximately six months was devoted to visiting key Corporates, Government department procurement bosses and leading national architects. The visits were to engage and interview these decision makers or market guardians to establish their views on market requirements and market futures. The market research activities embraced detailed meetings and presentations by Shell, BP, The Rabbo Bank, The Dutch Ministry of Economic Affairs and The Dutch Ministry of Agriculture. A series of fundamentally different performance criteria emerged from these studies in four countries, most notably the absence of daylight penetration in UK corporate floor plates. Other key issues embrace the polar opposite views of private office and open plan, how each territory powers and distributes network cables, and how shallow most European building plans are, again linked to health and well being rather than the economies of scale prevalent in the UK. Axiom emerged three years later and responded to the exceptional briefing dialogues in four European markets. In 2002 Atkinson Design Associates initiated a regional feasibility study to evaluate the forward benefits of a UK wood pellet industry based in the National Forest. The region has seen a dramatic reduction in coal extraction and coal industry employment over a 25 year period and part of the environmental clean up has seen significant land recovery and landscaping to North West Leicestershire with significant investments into the National Forest. 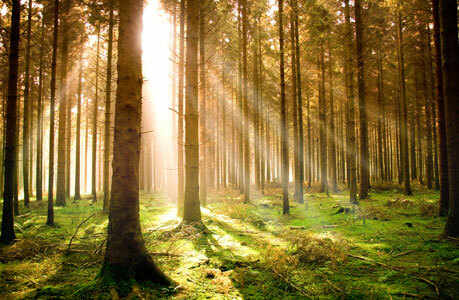 By 2030 the forest will yield 200,000 + tonnes of timber thinnings per annum. In response to this forward opportunity we built a small team expert in sustainable technologies including the architect Julian Marsh and Buro Happold the environmental engineers. Our project was to develop a pilot plant architecture to process 50,000 tonnes of forest thinnings per annum, as a simple but beautiful “micro energy” processing plant. Our feasibility study demonstrates that the 50,000 tonne facility will produce 240Gwh of renewable electricity per annum, with a total “UK exemplar” building and technology package costed at £3.8 million. The comparative cost to generate 4.6Gwh using solar technologies is £33 million. This is, in our view, a beautiful demonstration of the power of biomass as a source of renewable electricity. Although well understood in Sweden and other Northern European economies, our proposals in 2002 – 2003 seemed quite radical for the UK, nine years later the future of “biomass energy” is becoming recognised as vital to UK energy security. The Bede Island residential development was one of the largest private sector residential developments in the centre of Leicester during the early stages of the City Regeneration Project, a thirty hectare waterfront site immediately across the river Soar from the new Walkers Stadium. The award winning architect Anthony Goddard, who was master planning the Bede Island site and the City Council, insisted on the first new river crossing for one hundred years, to link this new development back to the City Centre. Our role was to work in close collaboration with the architectural team, the consulting engineers and the full City Council highways team to realise a “gateway crossing” to landmark the new development. The massing of both the residential development and the adjacent stadium describe the importance and delicacy of scale in these developments. Once we established that the new road bridge was subject to a 20mph speed limit and traffic control, the vital urban priority was to give the bridge to pedestrians, parents and children rather than the car. The scale and environmental massing of the bridge became vital but also the array of low level lighting bollards and transparent balustrades. The scheme developed by Atkinsons faced two dilemmas; The inherited scheme layouts for a shell and core development were not large enough for the clients management team and operational requirements. Secondly that the inherited scheme showed a labyrinth of corridors and the conspicuous absence of a passenger lift. The initial proposals which were immediately signed off by the client were for a second means of escape from the 1st floor office accommodation and a passenger lift at the heart of the scheme. These decisions immediately liberated the project and allowed considerable reduction of redundant corridor circulation combined with a significant increase in daylight penetration. The heart of the scheme is a double height glazed façade to the HQ entrance lobby with a glass bridge connecting the lift to a client conference room and a fully equipped demonstration kitchen for visiting customers. The Gazebo studies were commissioned by the architect Robert Reuter for a gallery exhibition on Long Island. Robert Turner from S.O.M, Paul Haigh from Haighspace, the sculptor Hy Zellkowitz and the industrial designer Gotz Unger were other exhibitors from a short listed group of six practitioners. The brief was constrained by Long Island planning codes which admit any construction not exceeding one hundred square feet in plan and eight feet in height. The pretext for the Gazebo also included waterfront view and vista, and human expectations or desires including shade, shelter, privacy, solace, contemplation, place and intimacy. The proposals ran to a study of ten parallel expressions. The floor plan of one hundred square feet was laid out in a geometry approximate to the human eye. This floor plan geometry then contained several deeply familiar elements as a minor theatre set. A solar – wind screen to enhance shelter and privacy analogous to the sight screen, an elevated umbrella to contribute to sun shade but also to reflect illumination out of darkness, an architectural scale viewing monument rising to six feet in height and a staircase to ascend and descend. Each element can be moved within the floor plate and recomposed to fine tune this environment to seasonal weather conditions. The Design Leicestershire project was initiated by Atkinson Design Associates in 2005. EMDA, the Regional Development Agency commissioned a sequence of studies and reports that addressed the creative industries across the East Midlands Region. During those studies the unique cluster of design companies in Leicestershire rose to prominence and the statistical evidence demonstrated a design industry cluster exceeding three hundred companies employing six thousand staff. Once EMDA accountants became aware of the financial contribution to the regional economy support for the Design Leicestershire project slowly fell into place. The challenge which embraced exhaustive planning and meetings over a three year period started with gentle attempts to draw this community together. As a result of slowly built momentum with broader and deeper participation, competitive suspicion was generally replaced by trust. We would particularly like to thank Jenny Hillier of Briggs Hiller for her support from the very first project meeting and also Trevor Flannery. One of the key milestones in the project was the publication of the Design Leicestershire Book, a three hundred page book celebrating the creativity of Leicestershire design practitioners. We have subsequently shared the book with Embassy staff in two European and two Far Eastern Countries. The response is one of unanimous surprise - that a cluster of such quality prevails in such a small geographic area. Our work for London Underground included the development of a new digital clock and timing system. The project required a detailed survey of 32 underground stations. London Underground demonstrates incredible diversity in built environment with infinite variation in architectural scale, form, volume, decorative treatments, materials, daylight and illuminated conditions. In addition the deeper central London Stations impose considerable electrical surge, vibration, air quality and health and safety responsibilities. The design challenges for the clock included a human sciences insight into “how we see time” in a complex urban environment, how to respect the historic identity of London Underground and how to develop a new display technology with a targeted 10 years mean time to failure. Part of the design process included a European Technology search of 220 display manufacturers. Atkinson Design created a shortlist of the eight leading display technology manufacturers based upon technology reviews and supplier demonstrations. Precedent clocks cost £4,000 + and failed in six and a half weeks, our mean time to failure had reached eight and a half years with a factory gate unit cost of £250 by the end of development. Christopher Nell, Head of Environments, London Underground Ltd. When we established the underlying principles for the Leicestershire Image Bank in 2002 we faced very different economic prospects. The Leicester Regeneration Company was about to deliver a city wide masterplan and the City of Leicester itself was about to see architectural investments exceeding £2 billion. Many debates were held in the City about the fitness for purpose of these regeneration plans and several were keen to point out that you don’t fix an economy just with new buildings. We argued that the story Leicestershire had to tell was significant and that traditional promotion of the City was woeful. 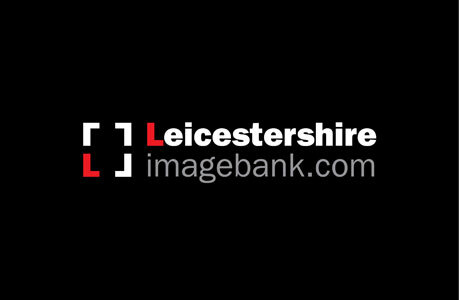 Through detailed consultations over a two year period the benefits of a startling photographic portfolio or an “Image Bank for Leicestershire” were unanimously supported. The three main strands captured by leading regional photographers embraced Architecture, Land and Buildings, Multicultural Leicestershire - a City of Festivals and perhaps the most difficult subject matter Research, Invention and Innovation; a record of world leading research activity at the three Universities in renewable energy, sustainable development, bioscience, sports science and space research. Over 70 stakeholders were consulted to establish that these three visual essays sat at the centre of our social, economic and physical regeneration and that if we could demonstrate this through a feasibility study then the portfolio would broaden to embrace the rest of Leicestershire’s economic and cultural strengths. With great thanks to the following photographers. Martine Hamilton Knight, John Higginson, Stuart Hollis, Rachel White, John Matterson and Peter Packer. 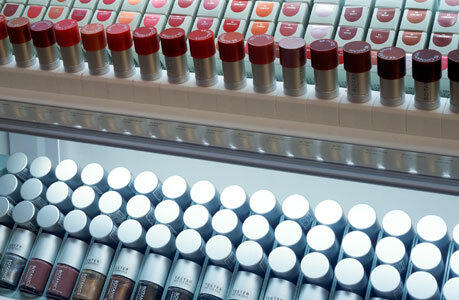 We have worked with several brand teams at Boots on some of the most significant cosmetics products in the market. In the case of Botanics we were commissioned to design the retail display that brought the brand together as one collection for the first time, this was followed by a very successful launch into 60 stores and led, within a year, to the Botanics Cosmetics brief which was launched with equal success. The work undertaken on No.7 was really a start from scratch briefing. 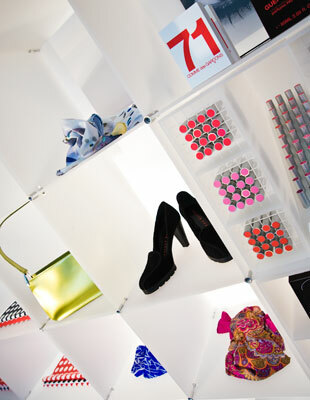 In competition with several UK retail design specialists ADA won the competitive pitch. The clients view was to pursue the proposed design strategy from ADA which realised three key design objectives simultaneously. To respect the No.7 brand aura whilst reducing its in store scale and complexity to an absolute working minimum. To reduce the commercial tooling for over four hundred brand products to a set of six modular industrial components. 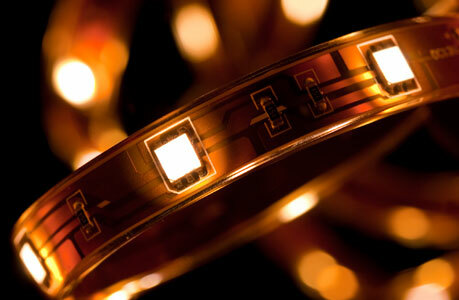 To reduce lighting energy costs for the brand in a six hundred store roll out by £750,000 over five years. Despite the rigorous simplification and rationalisation described, brand sales increased in the UK by 10% in year one and ROI for the entire investment occurred within the same calendar year. 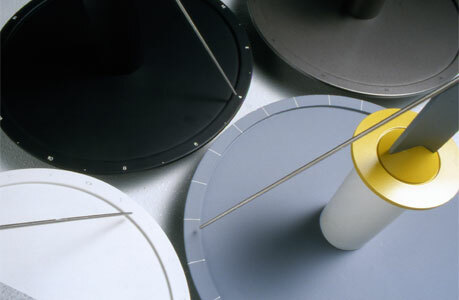 We filed our first UK wind generator patents during 2002 – 2003. The patents cover both the design and also the means of manufacture. These small scale wind generators were developed to test rig standards and we commissioned Professor David Infield at the Centre for Renewable Energy and Sustainable Technology to evaluate the first prototypes in the wind tunnel facilities at Loughborough University. Whilst accurate calibration and small vibration caused by imperfect development mouldings reduced the overall quality of the test data the wind tunnel trials were successful. A big surprise to David was the extent to which the turbine rotors still ran successfully when turning the test rig array on it turntable to an acute angle to the air stream. This R and D procedure followed by test results has led to two continuing wind rotor developments. The first continues the development of the helical generator geometry based upon the principles of the 2002 patents. 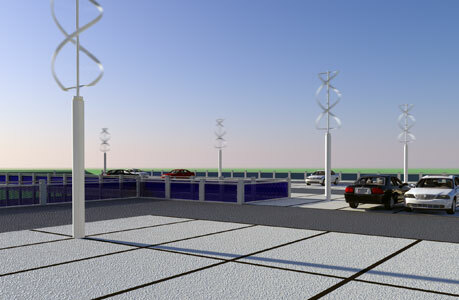 The second is a much larger wind rotor array of commercial scale that is subject to a new series of patent developments. 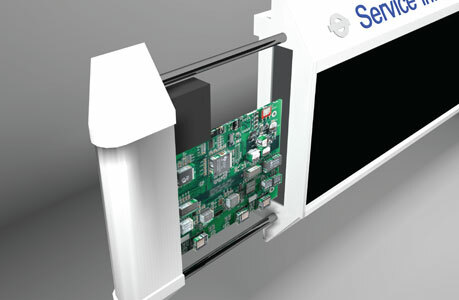 The second machine was subject to test rig field trials during October – November 2010. From the scores of hours spent on site and related theoretical studies we are well armed with design changes currently in progress. The Living Landmarks project was commissioned by the UK Arts Council Lottery Fund and Leicester City Council to accelerate the urban regeneration of central Leicester. The Landmark’s architectural team was led by Atkinson Design with Julian Marsh and Stephen George and Partners completing the team. Price and Myers were appointed as project structural engineers and Burro Happold as environmental and sustainable technology consultants. The six thousand square metre scheme was centred on a beautiful but derelict island in the Leicestershire river corridor, connecting communities to the West to the City Centre across a major new pedestrian deck. Six sustainable technology installations were imbedded into the scheme delivering a zero carbon project. These included two small CHP installations using wood pellet fuel delivering 70% of the project requirements for heat and electricity. The balance of electrical load was made up with a large photovoltaic array rising one hundred feet above the river, a linear helical wind generator, water source heat pumps and a small river embedded water turbine. Jon Nicholls, Head of the Leicester Regeneration Company was a champion of the project from day one stating “this derelict waterfront site is one of the most beautiful but neglected inner city sites remaining in the UK. If you can land me a landmark project of this quality it will accelerate the waterfront regeneration by at least four years.” Living Landmarks visuals by Tim Griffiths - Canwell Artworks. 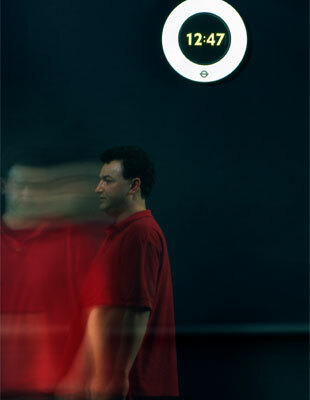 We started our lighting project in 2003 in partnership with lighting engineer Richard Hayes. We agreed that street lighting presented a large forward opportunity and we proceeded to read the research papers by Sam Berman published by Berkley University. Berman’s paper has profound implications for low carbon lighting. Most European and North American lighting levels are predicated upon Photopic instruments and sensitivity. Berman’s experiments challenge this fundamentally. Berman exposed his subjects to a procedure of seeing objects out of darkness under the light of differing lamp technologies and established that Scotopic Sensitivity was of greater importance under these conditions than Photopic Sensitivity. After reading these and other related research papers we concluded with Richard that if this was correct, then the low carbon opportunities were immense. 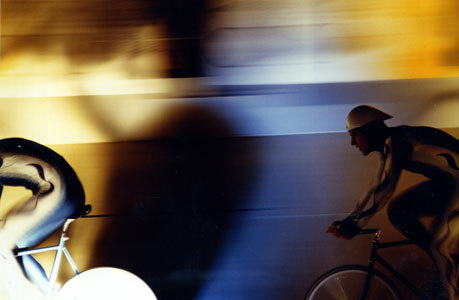 We agreed to finance a lighting trial in the City of Leicester to test the research. The trial, the first worldwide was measured by the Institute of Energy and Sustainable Development at DeMontfort University. The DeMontfort University campus embracing a city centre public highway was used for the lighting trial. The Gateway is illuminated with 150 watt high pressure sodium lights casting a typical orange – yellow glow and acts as a “project constant”. We installed our experimental luminaires housing 70 watt CDMT white light lamps to Mill Lane to establish a clearly visible contrast of lamp technologies and wattages. The research team published their results of the human response surveys in March 2006. The documentation is emphatic. We can cut street lighting electricity costs and C02 by 50% or more. The implications of this are relevant to Cities worldwide. Atkinson Design Associates purchased No. 1 Abbey Gate in 1990. The building was a redundant public house “The Cricketers Rest” and occupies a waterfront site one mile north of the City Centre. When we purchased the building the pub was derelict and had been boarded up for a number of years. The building re-design included consequential remodelling to the northern façade and the full restoration of the south elevation river terrace and façade. As a result of the change in use and the derelict state of the building, the interior required fundamental remodelling. The site remains an important gateway to the City of Leicester, sitting at the northern city edge adjacent to a river crossing established by the Roman City 2,000 years earlier. The design studio is a very light and optimistic workplace. The interior remodelling seeks to maximise daylight penetration. 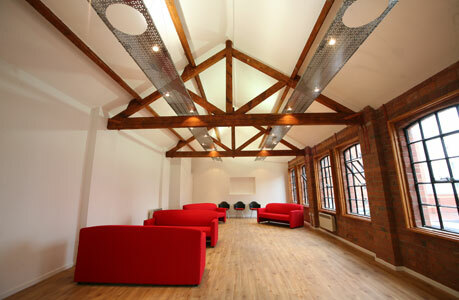 The ground and first floors were opened up into open plan floor plates. 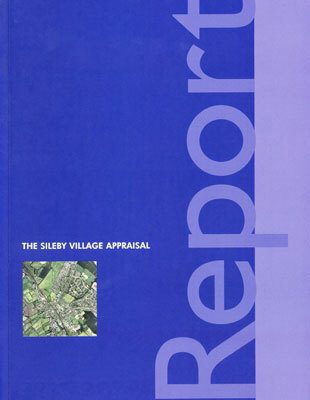 The Sileby Village Appraisal process represents a first deep immersion into community work, whilst touching the boundary edges of democracy, Parish Councils and Local Government. Working together with twenty concerned villagers who joined the Village Appraisal Committee, we negotiated a plethora of community difficulties. Few of us had a real understanding of how demanding this process would become. The Sileby Village Report accounts for many measures of inadequacy or incompetence in public transport provision, planning consent and development procedures and the lack of modern amenities or provision made for the young, the elderly and the disadvantaged. The village of Sileby has a population of ten thousand in approximately three thousand households. The seventy page questionnaire, hand delivered to three thousand households took a couple of years to write. In excess of 52% of the village returned fully completed questionnaires giving detailed answers to more than eighty questions. The village of Sileby has lost approximately two thousand light industrial jobs over a twenty five year period. This shift in manufacturing and employment patterns is almost a template for UK plc and very few in Government at any level appear to have adequate knowledge or concern about the process and even less capacity to do anything about it. 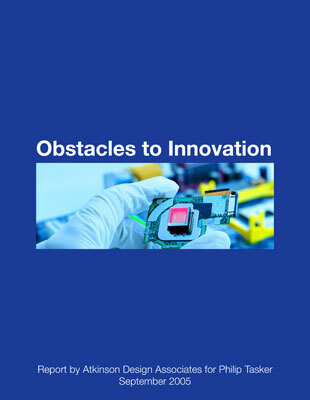 Obstacles to Innovation was a document drafted for consultation with Professor Philip Tasker Vice Chancellor, DeMontfort University. The purpose of the document was to lay out case history evidence of the “obstacles to innovation” prevalent in the regional and UK economy. There are many obstacles to innovation but the area that interests us most is regional economic development and the capacity to turn design innovation into new industrial employment. The growth of higher education and the role of the Higher Education Funding Council has been well documented over the past decade. This growth has led to a UK roster of approximately 50,000 UK University researchers with a nominal salary overhead of £50,000 each in an economy that has seen industrial shrinkage of 2% per annum for a decade. As design graduates we are pro education and pro research but if the UK is interested in wealth creation then it should take a look at the HEFCE model and its profound lack of contribution to UK wealth creation. Government and Ministerial expectations include fundamentally flawed expectations of science. Despite renewed commitments and investments in this sector, private sector industrial employment will be very slow to respond to such priorities. The beauty of design is that it is already surrounded by overwhelming volumes of new science and technology perhaps more today than at any other time in human history. The opportunity is to grasp design and design innovation and direct its focus on sustainable products for sustainable industrial employment. The speed of commissioning the project interior led the design team to inject all colour and space division into the furniture elements rather than the building interior which remained untouched. The project was completed in eight weeks and finished 48 hours before the opening ceremony. Future Visions of Design, Technology, Architecture and Consumption: The Forward Challenges of Climate Change. The Future Visions chapter of the Design Leicestershire Book, written by Paul Atkinson (MD of Atkinson Design Associates) leans heavily on the policies of Regan and Thatcher and the hatching of “Big Bang”. This period of the political empowerment of the rich and the headlong pursuit of wealth by this small minority created a profound shift in income disparity that is now the subject of deep debate and social division. Globalisation is a powerful instrument that both influences and cradles such greed…but does it have to? Is there any possibility for players in the global economy to act with moderation, there are a few remarkable examples. Future Visions explores design in the context of exponential development, its impact upon the environment and gives some clues for our uncertain destiny. The Bishopsgate Lighting Scheme was designed for the British Rail Architecture and Design Group working in close consultation with Anthony Hunt the appointed structural engineer. By the time Atkinson Design were appointed the glazed entrance canopy to the Bishopsgate Underground Station was at an advanced design stage. 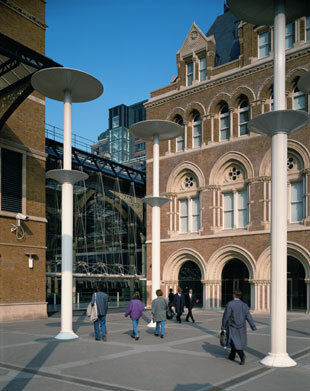 The parallel lighting project for the Liverpool Street public square and bus deck was in embryonic development at Atkinson Design, both the client and lead consultancy teams had agreed the underpinning design strategy of indirect illumination to both architectural spaces to minimise both shadowing and glare. In the specific case of Bishopsgate the client required glare free illumination to an entrance staircase descending approximately ten metres. 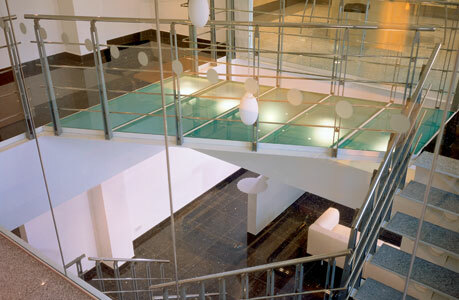 A guarantee of 300 lux on each stair tread compounded the difficulty of lighting this public entrance given the glass canopy overhead. 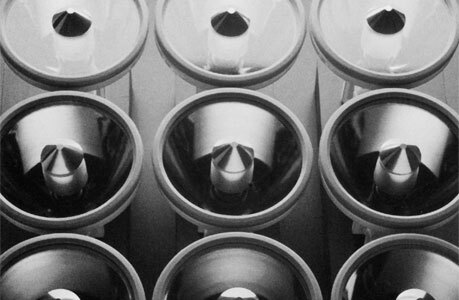 The series of enamelled steel reflectors at 2.4 metre diameter combined with an array of discharge lamps beneath resolved the challenge. The reflector cross section, combined with the array of discharge lamps and suspension distances proved to be critical in delivering 300 lux of glare free – shadow free illumination. All arrays are suspended on drawn stainless tubes 14mm in diameter, as we strived to keep such structure to a working minimum. 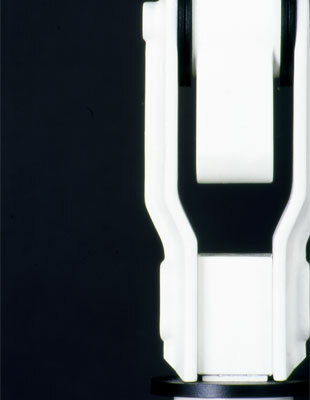 The design team developed a unique universal joint to guarantee reflector levels whilst accommodating power supplies through the centre of the suspension rods. Atkinson Design Associates were appointed as interiors consultants to the new Digital Media Centre in partnership with the project architects Marsh Grochowski. Interviews leading to the appointment were protracted, taking place over a two year tender period with an initial 70 + competitors. This schedule of accommodation included: Two state of the art cinemas, Café – Bar, Digital Exhibition Space, Technical Workshops, Studio spaces and Sixty three apartments. The project architects and the interior design team sought to maximise the capacity and flexibility of the interiors to integrate current and future digital technologies. The great dilemma with digital technologies and increasingly luminaire technologies is the rate of change and the speed of technical redundancy. Within all public areas of the building our design strategy sought to maximise the use and application of such technologies while minimising construction costs to change this equipment on a short horizon. The two central devices employed include an array of ceiling lighting rafts that integrate both direct and indirect lighting, combined with sound equipment, projector systems and flat screen displays. Whilst this overhead array has the mechanical integrity to accommodate such flexibility, the rafts remain visually quiet, most of this capacity is hidden from view. A similar strategy of network cabling behind the skin of the interior wall cladding enables the client to respond to changing technologies with minimal disturbance to the fabric of the building. 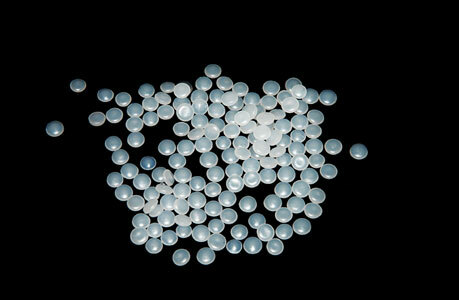 The Polymer Recycling project emerged out of our research into the food processing and food retailing industries. All UK food processing companies produce significant quantities of food packaging waste as a bi-product of production and shipping. Food retailers have an even higher ratio of cartons and plastics contained within the product cycle. A briefing priority for the anaerobic process is to quality assure mixed organic waste prior to processing, the removal of all non-organic materials is essential to this. Our industrial consultations made it clear that the recycling of organic waste to energy at competitive market cost is highly attractive to the food industry. But more significantly the recovery and separation of high value polymers adds considerably to the business case and waste minimisation policies of leading food industries. 4% of global oil is used by the food packaging industry. A high proportion of this goes to landfill or incineration, so the pressure on the food industry to do something beneficial is self evident. The challenge of recycling polymers to “biologically clean flake” ready for resale into the recycled plastics market has been addressed. Our small scale industrial plant can run in parallel with the anaerobic facility and is scaled at 5,000 or 10,000 tonnes per annum. The work was commissioned as a thank you present for our retiring CEO Ralph Atkinson. In addition to a party with a lot of longstanding clients and friends present, we felt the need to design something rather than buy a standard product. In an effort to make it all the more poignant and personal we commissioned our development engineer Janu Pap and the jeweller Nick Aikman.